I'd definitely like to see more! It reminds me of the old Star Wars and Star Trek technical manuals which had the little cutaway pictures like that. I've wanted this for as long as I've known about EVE. Books are nice but my house might fall down if I buy any more. Digital access would be awesome, even if it's something you sell. Or posters, the last batch were stunning, but some might like techie style images like this with all the bits labelled. ed. and postcard sized too. Not plastering EvE posters on my walls without a proper frame (which is pricey), and the card collection stuff doesn't appeal. But medium sized (maybe tablet level) in good quality finish would be nice. The art is excellent; the flavor text may even surpass it, IMO. If these are to be books, I'm in agreement that a digital version would be nice to see (eventually) on offer. You forgot the crew space. I dont like it, I love it. PS: dont change the UI, it have enough custamizability now, an d enough informations for everyone. And its a one man ship, capsule is there. 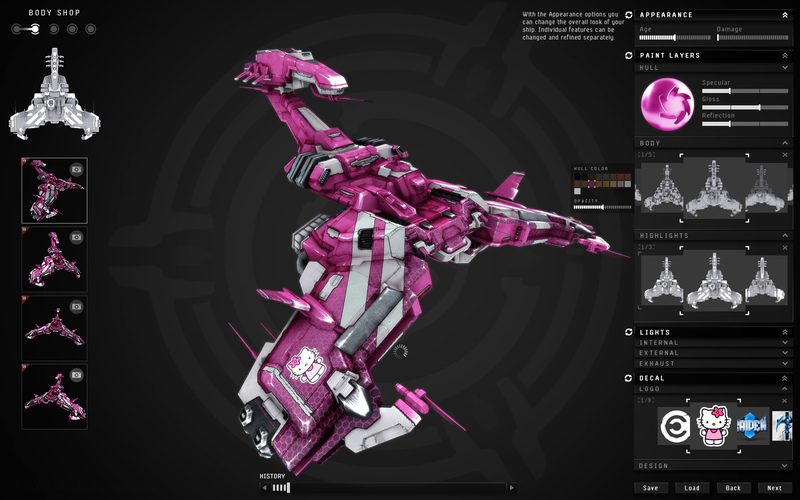 Custom ship skins, character creator style "repaint". Bring it! 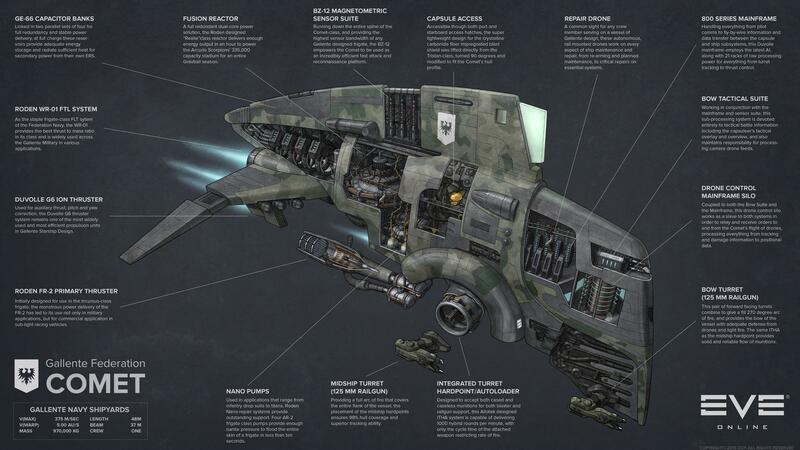 This is a capsuleer version of a Gallente frigate, which do not need much crew anyway because of the extensive use of drones. It makes perfect sense for a capsuleer frigate, which is not much bigger than a modern-day airliner, to have no crew besides the pilot. That is awesome! I'm curious that it seems the capsuleer can decant, but there doesn't seem to be much or any walkable-areas inside. Crew of One on the statistics refers to the capsuleer? Or is there one baseliner too? And what about the comet's two drones? Really though, I love these. More please! I'm thinking the Comet's drones would be externally mounted. Seems a pretty tight configuration in there. You forgot the muffler, air filter, aftermarket turbo and spoiler... Jeez. Does CCP accept blood as currency? I'm ready to sign. I am divided about adding fantasy stuff to EVE. Already was with the first Art of New Eden book. Why draw things that are not ingame? Yes it would be cool if our ships had a fusion reactor and a magnetometric sensor suite and whatever... but they don't. They are three life bars and a few values in a table. They are regularly and magically updated in all of New Eden by just writing different amounts in the table. It is better to fix it "drifter". And the new content does not smell. And do not forget to change your mind it the new Emperor. Emancipation of the slaves "to show that I was good"
We are proud to say that he would continue the policies of Heideran VII. "that would be even more love it"
Make it soft and fluffy. Incredible Cross-Sections, The book for EvE, Must HAPPEN! Make it so! Yes, I would like to see more. Much more. More understanding of how tge ship is engineered, constructed, interacted with by the humans. A bridge or cockpit is far more captuvating than a pod but ill take it as the lore is. More details please. What is a typical thukker caravan like? How many ships, how do they interact? Paint, insignia, organizations (is a rebel patrol 3 ships or 20), modules (what does a wzrp scrambler look like), colonies and stations. Details are fuel for the imagination.